In my past five years at college (yes, Education majors take 5 years to get a Bachelor’s at my school), I’ve learned how to do a lot of things. For example, I’ve learned that as you get older and take freshman classes you automatically have acting up privileges. When I took Music History last semester I was one of the two oldest people in the room with the exception of my amazing professor. If you’re old and taking an intro class for fun, you get the rights to joke around, yell out, and come in late. I’ve learned how to get kicked out of a professor’s office, and I’ve learned that putting Chapstick on a ScanTron sheet DOES NOT get you a perfect score. I thank Keith for trying that out in our Botany class (I’m convinced that class was actually the 5th circle of Hell, but I don’t think I deserve that punishment). The best thing I’ve learned is setting up a workspace. I’m currently working on my Metacognition project for my Teaching of Writing class. We had to observe an organic object for a week, write about it, and then interpret our thoughts with the use of other “thinkers.” Sounds fun, right? It is! But it’s insanely hard to stay focused sometimes when I’m “thinking about my thinking.” So I set up the perfect workspace. Behold, the perfect college student workspace. Make sure to lay EVERYTHING out that you’re going to need to write, and throw it all over the place. You don’t want to ACTUALLY be able to access your keyboard. Next, you need food. My choice is usually Goldfish. Delicious, easy to grab, and cute. You’re going to need a drink to wash down that snack, so type a sentence of your paper, go downstairs, and get a Diet Coke. In the kitchen, you’ll realize that you need to smoke a cigarette. No good paper gets completed without mass amounts of Nicotine running through your veins. When you get back upstairs, you’ll realize that your cat has burrowed herself into your quilt and looks completely adorable. Sit with her and watch re-runs of “Everybody Hates Chris” for an hour or so. Realize that your paper still isn’t done and start typing like a crazy person for the next 45 minutes. Bring it to your workshop and smile, your peer reviewer loved it, and your professor granted everyone an extra week and a second workshop since no one showed up to class. Begin the cycle again in about a week. This is one of the coolest projects I’ve ever done, though also one of the most challenging. I completed my second draft and am really excited to see how it goes in my workshop tomorrow. For the record, I observed a tiny, baby Maple tree in my backyard. I uploaded the photos of my tree on flickr. Go to the “Things I Like” collection and you can see Day 1, Day 3, and Day 7 of my adorable tree. Glad to hear that you enjoyed doing the project:) That is great:) I also need to do some school work soon! ow. you mean like an open forum about the ideas? hahaha. awww. such a cute cat! Love the workspace! LOL! College is great isn’t it? Your cat looks nice and cozy. 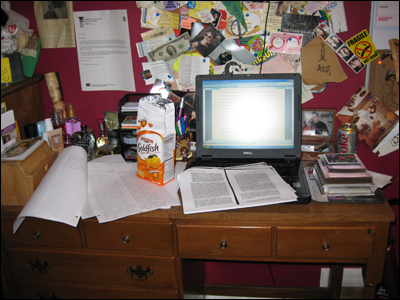 Lol, your workspace looks an awful lot like mine…only much neater! No matter how often I try to clean my desk it’s cluttered like anything within a day (or even hours). It’s cool that you get “acting up” priviliges at college though. I hadn’t heard of the chapstick trick before…very amusing! Pity it doesn’t really work though.